Concurrent ligamentous knee injuries have been reported in 43% to 80% of patients in studies examining both acute and chronic PLC injuries. 68% of cases had a PLC injury and 5 of 7 patients with a medial tibial plateau fracture had a PLC injury. ACL reconstruction causes a persistent pivot shift in over 15% of cases. Main cause of graft failure is the presence of unrecognized, and therefore untreated, PLRI. The Posteriolateral compartment (PLC) can be described as consisting of 5 structures (2 muscles and 3 ligaments); the lateral head of the gastrocnemius, the popliteus, the popliteofibular ligament, the lateral collateral ligament (LCL), and the arcuate ligament–fabellofibular ligament complex. The biceps femoris tendon and iliotibial band also contribute to the stability of the PLC of the knee, and may be damaged with injuries in this region. The PLC serves as the primary restraint to both varus and external rotation forces, with the PCL acting as a secondary restraint. The LCL plays the greatest role in resisting varus stress, while the other components of the PLC play a larger role in resisting external rotation of the lateral side of the tibia on the femur. The popliteus and popliteofibular ligament, in particular, have been shown to be the most important structures in resisting external rotation. Disruption of the PLC with an intact PCL results in increased varus and external rotation of the knee, most pronounced at 30° of knee flexion, while disruption of the PCL with an intact PLC results in increased posterior translation of the tibia, most pronounced at 90° of knee flexion. Disruption of both the PLC and PCL causes increased varus angulation, external rotation, and posterior translation at all angles of knee flexion . Look for posterior sag, and apply anterior force if supine or test prone for neutral tibial positioning. Standard radiographs of the knee can show several findings suggestive of acute PLC injury, including abnormal widening of the lateral joint space, fibular tip avulsion fracture or fracture of the fibular head, avulsion fracture off Gerdy’s tubercle in iliotibial band injuries, tibial plateau fracture, or even a Segond fracture. Although Segond fractures typically occur with ACL tears, they also can occur in isolated PLC injuries. Recent studies have shown that either T1- or T2-weighted coronal oblique images through the knee and including the entire fibular head and styloid process provide the best visualization of the individual structures of the PLC. Magnetic resonance imaging will also detect associated injuries, including ACL and PCL tears, fractures, and bone contusions, which typically occur in the medial femoral condyle or medial tibial plateau. The same measures that are used during the examination process can be used post-op to test for knee instability. Additionally, you can observe tibial ER during gait and gather subjective information from the patient such as if episodes of giving way have decreased and their overall sense of stability of their knee. There is no single deﬁnitive tool exists in diagnosing posterolateral corner injuries. Knee Rotary instability is commonly seen with injury to the cruciate ligaments. It is important with either type of injury to address the instability by reconstructing the PLC concurrently. Isolated reconstruction of the ACL and PCL alone is not enough to provide rotary stability. Reconstruction of the PLC is necessary to reset the knee to nearly physiological laxity patterns. Also, the PFL and PT have similar in situ forces that add to the idea that PLC components may play equally important roles in restoring knee stability. Over time this strain from lack of stability leads to lengthening, laxity and an increased force on the ligament grafts leading to graft failures. It has been suggested numerous times that this instability is in fact the main cause of graft failure. It was found that that reconstruction of the PLC is best done at the same time as the PCL and ACL reconstructions. Grade III almost always require surgery. Grade II can be managed non-operatively. A more severe grade II injury or an injury associated with cruciate ligament tears or tibial plateau fractures should be addressed surgically. Grade I is treated nonoperatively with good results. If the patient is stable, surgery should be performed within 3 weeks of injury so that the PLC can be repaired primarily. Reconstruction rather than repair is most common in patients who have posterolateral tears and injuries. Reconstructive procedures can again be divided into those that attempt to restore the normal anatomy of the PLC and those that nonanatomically stabilize the PLC by tightening specific structures. The best way to reconstruct the PLC is being researched. Hamstring autograft, particularly the tendon of the biceps femoris long head has been shown to be effective. A modified version of Larson’s technique called the modified posterolateral corner sling method is commonly used. The most important structures for reconstruction of the PLC are the popliteus tendon, LCL, and specifically the popliteofibular ligament. Passing through the lateral aspect of the tibia. Passing through the fibular head tunnel along with a 1 cm anterior lateral epicondyle tunneling by passing the tendon medially with a bioabsorbable screw fixation at the lateral side. The fibular head tunnel shows better results than the tibial tunneling. It has been shown that protected weight bearing of the extremity for the first 2 weeks is usually necessary, and should be followed by a progressive rehabilitation program. Rehabilitation should include quadriceps-strengthening and progressive resistance exercises, as well as protected range of motion activities. Physical therapy should impairment-based treatment. The knowledge of the physical therapist and patient’s presentation should be used to determine where the patient should start and how rapidly they should progress. Exercises should start with basic muscle strengthening and then move to higher level sport specific drills. Opened Chain exercises have historically thought to produce extra shearing forces, however it has proven that greater quad strength gains can be made compared to closed chain. Even though there is a proven benefit from open chain exercises, majority of time should be spent doing closed chain exercises because they can provide proprioceptive input and proper co-contraction of antagonist and agonists muscles. In addition it can help to improve the strength, function, and stability both a joint above and below. Perturbation exercises help to provide protection of the joint, improve knee kinematics, and neuromuscular training. Exercises that can be performed are: single leg stance and squats, double-leg activities, and lunges. These should be performed on surface that require the patient to create there own stability. All of these should initially begin anterior to posterior and medial to lateral then progress to diagonal and rotational movements. Additional things that could be addressed are muscles of the hip and ankle, bracing and taping which would help to provide stability in the entire lower limb. Ricchetti E, Sennett B, Huffman G. Acute and chronic management of posterolateral corner injuries of the knee [corrected] [published erratum appears in ORTHOPEDICS 2008 Jul;31(7):725]. Orthopedics [serial online]. May 2008;31(5):479-490. Available from: CINAHL Plus with Full Text, Ipswich, MA. Accessed July 13, 2011. Knee rotary instability occurs most commonly with concomitant ligamentous injuries. It is difficult to diagnose, treat and is often missed due to different clinical presentations and lack of protocol. Physical therapy treatment and surgical intervention will both depend on the severity, location, structures injured, and patient's abilities and goals. ↑ 2.0 2.1 Lee S, et al. Combined reconstruction for posterolateral rotatory instability with anterior cruciate ligament injuries of the knee. 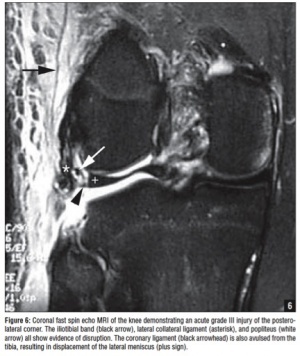 Knee Surg Sports Traumatol Arthrosc (2010) 18:1219–1225. ↑ 3.0 3.1 3.2 3.3 3.4 Young-Bok J, et al. The Inf uence of Tibial Positioning on the Diagnostic Accuracy of Combined Posterior Cruciate Ligament and Posterolateral Rotatory Instability of the Knee. Clinics in Orthopedic Surgery 2009;1:68-73. ↑ Ricchetti E, Sennett B, Huffman G. Acute and chronic management of posterolateral corner injuries of the knee [corrected] [published erratum appears in ORTHOPEDICS 2008 Jul;31(7):725]. Orthopedics [serial online]. May 2008;31(5):479-490. Available from: CINAHL Plus with Full Text, Ipswich, MA. Accessed July 13, 2011. ↑ Tiamklang T, Sumanont S, Foocharoen T, Laopaiboon M. Double-bundle versus single-bundle reconstruction for anterior cruciate ligament rupture in adults. Cochrane Database of Systematic Reviews 2010, Issue 3. Art. No. : CD008413. DOI: 10.1002/14651858. CD008413. ↑ 8.00 8.01 8.02 8.03 8.04 8.05 8.06 8.07 8.08 8.09 8.10 8.11 8.12 8.13 8.14 Ricchetti E, Sennett B, Huffman G. Acute and chronic management of posterolateral corner injuries of the knee [corrected] [published erratum appears in ORTHOPEDICS 2008 Jul;31(7):725]. Orthopedics [serial online]. May 2008;31(5):479-490. Available from: CINAHL Plus with Full Text, Ipswich, MA. Accessed July 13, 2011. ↑ Dr Bancha, Dial Test PLC Injury Knee Ligament Examination [Video]. YouTube. http://www.youtube.com/watch?v=4ffLZG8dLxs. Published June 27, 2008. Accessed July 16, 2011. ↑ 13.0 13.1 13.2 Jung Y, Jung H, Lee S, et al. Posterolateral corner reconstruction for posterolateral rotatory instability combined with posterior cruciate ligament injuries: comparison between fibular tunnel and tibial tunnel techniques. Knee Surgery, Sports Traumatology, Arthroscopy [serial online]. March 2008;16(3):239-248. Available from: CINAHL Plus with Full Text, Ipswich, MA. Accessed July 16, 2011. ↑ Tashiro Y, Okazaki K, Iwamoto Y, et al. Quantitative assessment of rotatory instability after anterior cruciate ligament reconstruction. American Journal of Sports Medicine [serial online]. May 2009;37(5):909-916. Available from: CINAHL Plus with Full Text, Ipswich, MA. Accessed July 16, 2011. ↑ Mauro C, Sekiya J, Stabile K, Haemmerle M, Harner C. Double-bundle PCL and posterolateral corner reconstruction components are codominant. Clinical Orthopaedics & Related Research [serial online]. September 2008;466(9):2247-2254. Available from: CINAHL Plus with Full Text, Ipswich, MA. Accessed July 16, 2011. 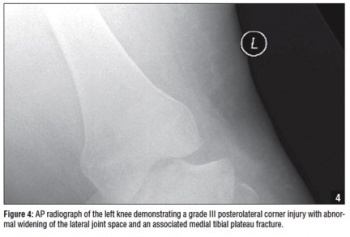 ↑ Stannard J, Brown S, Farris R, McGwin G, Volgas D. The posterolateral corner of the knee: repair versus reconstruction. American Journal of Sports Medicine [serial online]. June 2005;33(6):881-888. Available from: CINAHL Plus with Full Text, Ipswich, MA. Accessed July 10, 2011. ↑ Veltri D, Warren R. Anatomy, biomechanics and physical findings in posterolateral knee instability. 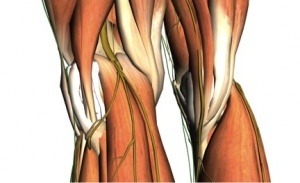 Clinics in Sports Medicine [serial online]. July 1994;13(3):599-614. Available from: CINAHL Plus with Full Text, Ipswich, MA. Accessed July 10, 2011.